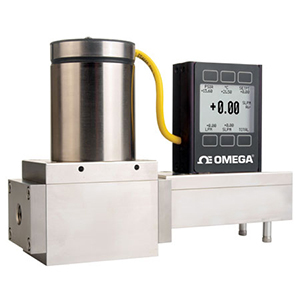 The FMA-2600A Series mass and volumetric flow controllers use the principle of differential pressure within a laminar flow field to determine and control mass flow rate. A laminar flow element (LFE) inside the meter forces the gas into laminar (streamlined) flow. Inside this region, the Poiseuille equation dictates that the volumetric flow rate be linearly related to the pressure drop. A differential pressure sensor is used to measure the pressure drop along a fixed distance of the LFE. This, along with the viscosity of the gas, is used to accurately determine the volumetric flow rate. Separate absolute temperature and pressure sensors are incorporated and correct the volumetric flow rate to a set of standard conditions. This standardized flow rate is commonly called the mass flow rate and is reported in units such as standard cubic feet per minute (SCFM) or standard liters per minute (SLM). The controller uses a true proportional valve coupled to the flow body to control flow using the integral PID loop controller. Standard units include a 0 to 5 V output (4 to 20 mA optional) and RS232 communications. The gas-select feature and the setpoints can be adjusted from the front keypad or via RS232 communications. Volumetric flow, mass flow, absolute pressure, and temperature can all be viewed or recorded through the RS232 connection. It is also possible to multi-drop up to 26 units on the same serial connection to a distance of 46 m (150'). Wetted Materials: Small Valve: 303 & 302 Stainless Steel, FKM, Heat Cured Silicone Rubber, Glass Reinforced Polyphenylene Sulfide, Heat Cured Epoxy, Aluminum, Gold, Brass, 430FR Stainless Steel, Silicon, Glass. Large Valve: 303 & 302 Stainless Steel, FKM, Heat Cured Silicone Rubber, Glass Reinforced Polyphenylene Sulfide, Heat Cured Epoxy, Aluminum, Gold, 416 Stainless Steel, Silicon, Glass. 참고: Comes complete with 24 Vdc universal power supply, 1.8m (6') cable, 8-pin male Mini- DIN connector, operator's manual, and NIST certificate. Standard units are calibrated to air @ 5 psig for 0 to 1 LPM, 15 psig for 2 to 10 LPM, 30 psig for 20 to 100 LPM, and 50 psig for 200 LPM and greater. For custom calibrations, add "-(*)" to the model number, no additional cost. *Specify gas, and inlet/outlet or backpressure for custom calibrations. Calibrations done at ambient (25C/77F) temperature only. To replace the standard RS232 communications with RS485, add suffix "-RS485" to the model number, add $120 to the price. Standard input is 0-5V, for optional 4-20 mA input add suffix "-IN" to the model number, no additional cost. Standard output is scaled to the mass flow rate. For volumetric flow rate as standard output add suffix "-VOL" to the model number. For "-VOL" controllers the control loop is set to volumetric as standard. Optional secondary output are scaled the same as the primary output scale. For an alternate output scale add suffix "-V2T" for voltage scaled for temperature, "-I2T" for current scaled for temperature, "-V2P" for voltage scaled for pressure or "-I2P" for current scaled for pressure, no additional cost. For units scaled in SCFH, add suffix "-SCFH" to model number, no additional cost. Please specify the desired range in SCFH. For totalizer option, add suffix "-TOT" to the model number, add $120 to the price. Please specify resolution. This is a 6-digit counter. Examples: For totalizing in liters with 1/100 liter resolution, the max count would be 9999.99. For totalizing in liters with 1 liter resolution, the max count would be 999999. For a Remote Display, add suffix "-RD-*FT" to the model number, add $210 to the price. Replace the * in the suffix with the required length in whole feet, the maximum length is 3.6576 m (12'). Please note the optimum distance in feet is between 2.7 to 3 m (9 to 10'). Ethernet/IP, DeviceNet, Modbus and Profibus communications are also available for an additional charge.